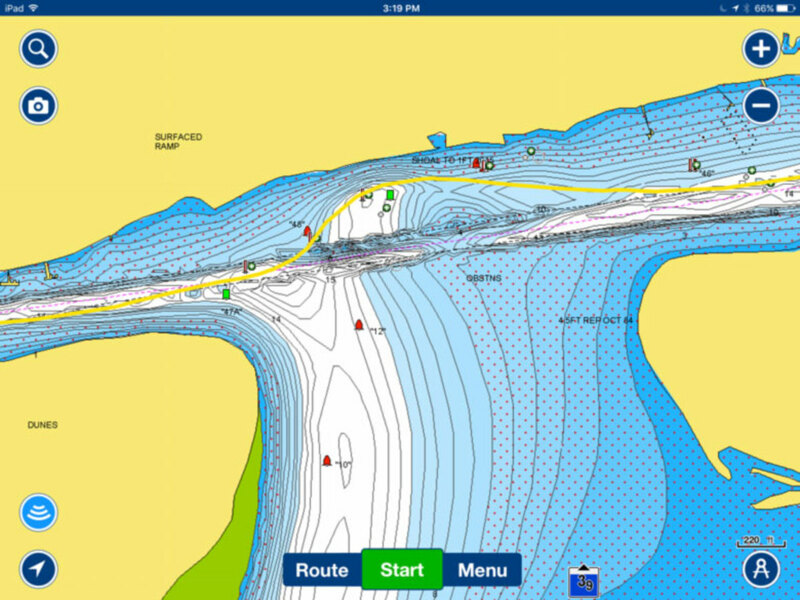 Whether you are in the planning stages for a southbound ICW cruise in 2018 or you are looking at a northbound trip this spring, it is important to know where the shallow spots are along the ICW. It is wise to mark your charts and familiarize yourself with these so that you are generally aware of those places which need to be transited with a little extra care and planning. None of these are dangerous and all of them are in areas with adequate tidal range such that if you wait till the tide is rising you can proceed with plenty of clearance. The following is a list of the known trouble spots. Whether you are in the planning stages for a southbound trip in 2018 or you are looking at a northbound trip this spring, it is important to mark these areas on your charts so that you are generally aware of these places which need to be transited with a little extra care and planning. None of these are dangerous and all of them are in areas with adequate tidal range such that if you wait till the tide is rising you can proceed with plenty of clearance. Once the tide starts to fall, you should take extra precaution though. 4. 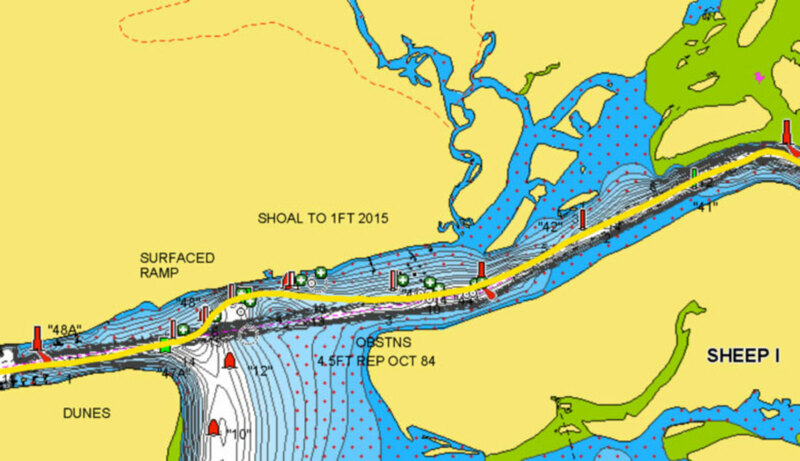 Black Mud Channel, AKA New Topsail inlet, STM 270. Dredged spring of 2017, Does not seem to have been much affected by 2017 hurricanes, but conditions can change. 5. Mason Inlet SM 280 Dredged spring of 2017, Does not seem to have been much affected by 2017 hurricanes, but conditions can change. 7. Snows Cut Several reports of shoaling near the west end. 8. Lockwoods Folly STM 320 Dredged spring of 2017, The channel was much affected by 2017 hurricanes. You must have updated charts. and conditions can change. 10. Estherville Minim Creek Canal. STM 410 North end. 12. South of McClellanville. A known problem area with only 4.5 feet at low water. Watch for updates as this stretch has been getting worse. 13. Dawho River. STM 498 east end there are some reports of water less than 5 feet MLLW. 14. Ashepoo River and Ashepoo Coosaw Cutoff. STM 513 to 518 Reports of shoals in several places. Transit on a rising tide. Watch for updates from early travelers. 15. Hell Gate (note, this is NOT called Hell’s Gate) STM 601 A known problem area with only 4 feet at low water. Watch for updates as this stretch has been getting worse. 16. Little Mud River STM 653 to 656 A known problem area with only 4.5 feet at low water. Watch for updates as this stretch has been getting worse. 17. Jekyll Creek STM 680 to 684 A known problem area. Some reports of adequate depth some with only 3.5 feet at low water. Watch for updates as this stretch has been getting worse. 18. Cumberland Dividings STM 704 A known problem area. There is plenty of water if you stay on the greens. Watch for updates. 19. South of Fernandina. STM 717. This area was dredged in November and December 2017. As of January 15, I have seen on NOAA, USCG, USACE or Active Captain updates. 20. Ft. George Channel. STM 735 Some reports of shoaling. We had no trouble in the spring or fall of 2017. Watch for reports from early north bounders. 21. Fort Matanzas. STM 781. Dredged spring of 2017, but conditions can change in this traditional trouble spot. 22. Ponce Inlet. STM 840-842. Several reports of shoaling. Watch for updated reports. 23. St. Lucie inlet STM 988. Some reports of shoaling. We had no trouble in the spring. In our next post, we will provide tips for managing these trouble spots with websites to get updated information.